The waffles were made and eaten, as well as the homemade breakfast sausages (Note to husband, there is no such thing as too much maple. Thank you for the beef sausages). A LOT of presents opened and then played with, batteries charged so other toys can be played with. New movies watched. Alex has not yet taken off the winter hat given to her by my in-laws, she loves it so much. I had to break our resolve not to change out of pj's all day because we needed eggs - chocolate chip cookies can't be made without them. Fresh bread, an apple pie in the oven and chocolate chip cookies the kids made - with minimal supervision - queued up. Some highlights: Alex saying this was the best Christmas ever primarily because we got to wear pajamas all day, even when we went outside to play in the snow (thank you snowpants). Alex excitedly running out to tell Terry about one of the kitchen science experiments we did this morning and telling him "It's all fizzing over like beer!" Zoltan making tunnels and mountains out of his own body as the new electric train runs around the track. Terry got the VPN working so Target no longer scorns me when I try to access its web site. And, for the first time ever, thanks to living in a Muslim country ...... when Terry cooks up his traditional Christmas ham for dinner there was a ham just for me made from beef! Merry Christmas indeed! In the last month, we have been starting to enjoy what winter in Astana has to offer. We went ice skating at a rink, which was important for getting some of our skates sharpened. We then spent a few hours at the embassy skating rink (yes, you read that right. The embassy constructed an ice skating rink on the compound. 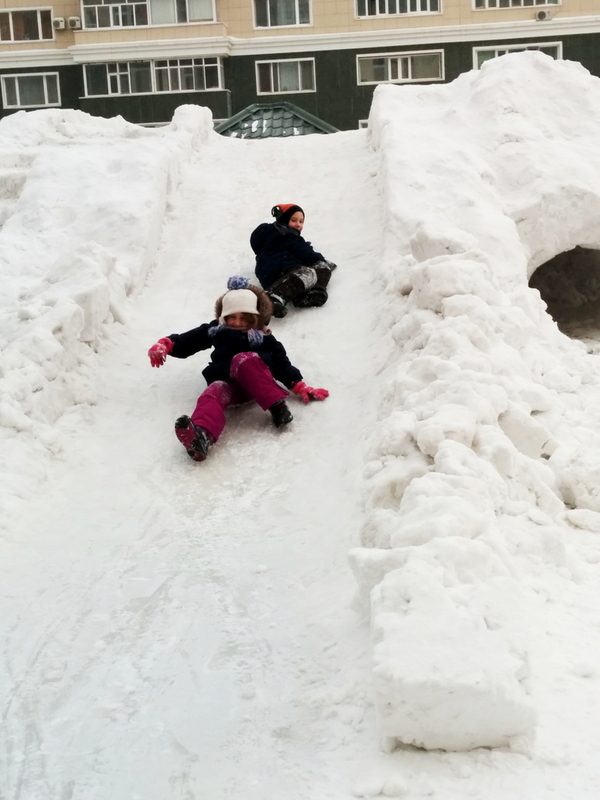 Our awesome facilities manager also created sledding hills out of mounds of snow.) Here's the awesome part: on the embassy rink, for the very first time ever, Zoltan consented to skate without holding on to anyone or any thing. And after skating around for about 10 minutes on his own, he grabbed his hockey stick and started passing the puck with Terry. He immediately fell down after every shot. This was probably not on purpose in the beginning, but he definitely had decent enough stability towards the end that he didn't have to fall down. When skating around he would fall down and bounce right back up with an "I'm Good!" Alex also had her stick and the three of them had a grand time until the blisters from her new skates started to bother her too much and bad mommy hadn't brought Band-Aids so she got benched. Somewhere along the line Terry got his hands on a leftie stick so I will soon participate as well. He was in absolute heaven playing with the kids on the ice. This is his dream come true. There is also an ice skating rink at our apartment complex. created from boarding up and flooding a soccer pitch. They recently added benches right outside the gate, and even flooded that area so from the time you get your skates on you are on ice. 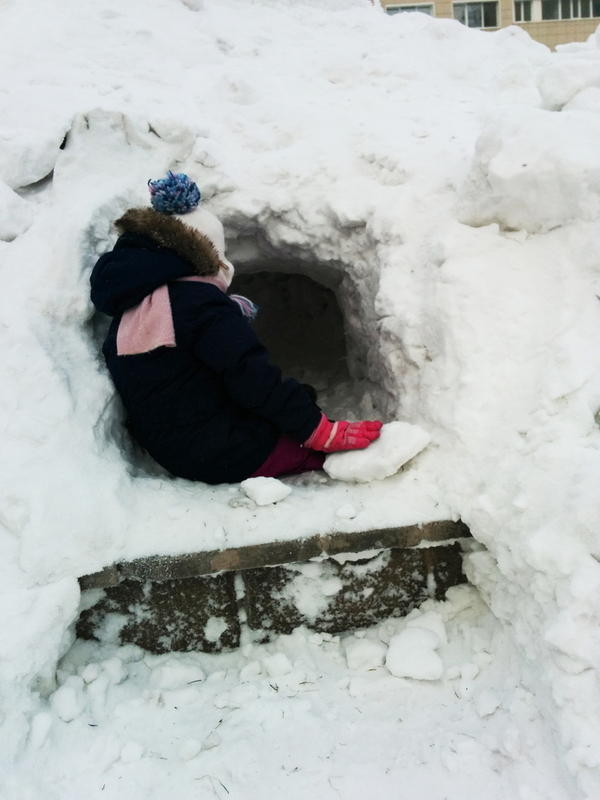 Finally, the kids and I went to explore another phenomenon at our apartment - a sledding ramp, all iced over to keep the sled going farther, with stairs cut into the snow mound and a tunnel to play with off to the side within the same snow mound. We played out there for a good hour and the kids wanted to stay longer. We haven't even looked for the ice city we hear gets constructed around now each year, nor have we yet snowshoe'd or skated on the river. It's a good thing it's a long winter! The day after the "psych out" I was certain something new would arise to prevent the resumption of cohabitation between my stuff and my family. Our stuff was scheduled to arrive at 13:00. At 12:30 I was starting to get ready to go home, because if they say your stuff is coming, you go home even if you think they are teasing you. The phone rang and the voice on the other end of the line said "The boxes are here early. Can you come home now?" These movers were fabulous. Very helpful, respectful, calling out the box numbers for me to check off my own handmade list (also good practice for Russian three digit numbers recall) and patiently waiting while I figured out which room each box should be put in. The unpacking got overwhelming, and in several cases I had to tell the movers to stop unpacking things because a pile on the floor needs immediate attention whereas a pile neatly boxed can wait until tomorrow if necessary and there is a critical threshold of floorspace that cannot be cleared in a day. As expected, everything was cold. Some things frozen solid (shampoo). Some things exactly the right chilly temperature for enjoyment immediately (Yeungling). We put all the items that, once cold, should probably not resume room temperature in one bedroom's balcony and opened the window to the outside. We now have until April or May to consume everything located therein. And for some other items, we now play the game of "can this, frozen and then thawed, be safely consumed?" My stuff arrived in town the day after Thanksgiving. The Monday afterwards is a local holiday. I was a little surprised and definitely pleased to receive a phone call Tuesday morning telling me customs had cleared my stuff and I needed to be home by 1:00pm to receive it (the call came just before noon). I ran around letting my boss and others know, and hopped in the car to get home in time. Lunch? Who needs that when you're pumped up on reuniting with snow tires that so helpfully keep you from getting killed as you get across town? I got home, changed into jeans, and waited. At 1:15pm I sent an email to the embassy shipping guy. At 1:30pm I was looking up his phone number when he called. Oops. Not today. Maybe tomorrow.